From business owners to industry leaders and laser experts, the best and brightest in manufacturing gathered from April 25-27, 2016 in Atlanta, GA, for LIA’s most cutting-edge Lasers for Manufacturing Event® (LME®) and Summit yet. I came to see the latest technology to help my manufacturing production. I saw everything I needed to know! Beginning on April 25 with the Summit at the Renaissance® Atlanta Waverly Hotel, and continuing with the two-day LME on April 26-27 at the adjacent Cobb Galleria Centre, the fifth installment of LIA’s comprehensive, three-day manufacturing event once again served as the premier hub for both companies interested in exploring the integration of laser technology into their production, and attendees seeking the latest insights from the leading authorities in laser technology. The Lasers for Manufacturing Summit, which first debuted in 2014, serves as the foremost afternoon and evening for executives and the C-Suite. During the event, Summit presenters covered the economic outlook of the laser industry, the evolution and applications of laser welding, and shared their stories of success. Editor-in-Chief of Industrial Laser Solutions and LIA Past President, David Belforte, moderated the Summit’s signature Laser Manufacturing Forum, featuring panelists from several high-profile companies that manufacture with lasers. The event concluded with an evening VIP reception, where attendees networked with high-level executives and Summit speakers. Follow the latest Lasers for Manufacturing Summit updates at http://www.lia.org/lasersummit. Once again, the Laser Technology Showcase proved to be a main highlight for LME attendees. Featuring an engaging set of 30-minute keynote addresses, speakers shared the advantages of utilizing laser technology, including Summit forum leader David Belforte, who returned to present the first keynote speech with his Industrial Laser Market Overview. Following were presentations such as Shawn Kelly of EWI’s Laser Technology and Metal Additive Manufacturing, Ralf Kimmel of TRUMPF Laser and Systems GmbH’s Laser Applications in Automotive Manufacturing, and GE Global Research’s Marshall Jones’s Industrial Applications of Laser Material Processing in GE. For additional questions and insights, attendees stopped by the ‘Ask the Expert’ booth, headed by Neil Ball of Directed Light Inc. and 20 other industry leaders. One of LME’s newest 2016 offerings was the Laser Technology Tour – an intelligible way for first-year attendees to explore the event. By simply registering for LME and signing up, attendees were able to take advantage of the personal guidance of seasoned event experts, who walked them through the exhibit floor and introduced them to different companies, all while discussing the latest technology and products showcased. The guidance offered at the Summit, in the LME technology showcase, during the educational sessions, and on the exhibit floor allowed attendees to not only obtain crucial information on incorporating lasers into their production, but critical assistance in getting started with instant access to top suppliers. In all, the 2016 LME was exciting, inspiring and informative – and just like this year’s event, the next LME and Lasers for Manufacturing Summit will continue to be the foremost gathering place for the latest developments and insights for lasers in the manufacturing industry. 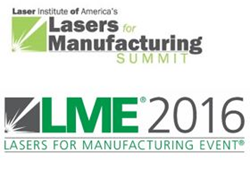 For additional information about LME or the Lasers for Manufacturing Summit, please visit: http://www.laserevent.org and http://www.lia.org/lasersummit.